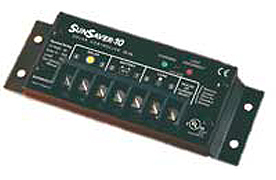 Morningstar’s SunSaver Duo is an advanced PWM two battery controller for RV’s, caravans boats and cottages. This includes a backlit remote meter which may be mounted anywhere. It displays digital and pictorial status info about the solar power system. The unit is a 3 function controller that provides reliable solar battery charging, load control or diversion regulation. Advanced technology with automated production at a competitive cost. UL listed and is designed for both solar home and professional applications. 3-position battery select: gel, sealed or flooded. Parallel for up to 300 amps. Current compensated low voltage disconnect (LVD) LED’s indicate battery status and faults. Adds new features and protections using highly advanced technology. Provides longer battery life and improved system performance.